Gamekeepers and moorland managers throughout Scotland are at the forefront of combating the number of ticks in the countryside and ultimately the spread of Lyme disease. Tick control methods include sheep dipping and bracken spraying, as well as careful management of deer and hare numbers on grouse moors. With May being ‘Lyme Disease Awareness Month’ we hear from guest blogger Janey Cringean on why she, along with many other sufferers, is so fervent in her efforts to improve the diagnosis and treatment of Lyme disease. The most common blood-sucking tick in the UK is the sheep tick (Ixodes ricinus) which can spread the louping-ill virus (LIV) and cause up to 80% mortality in red grouse chicks. This same species of tick can also transmit Lyme disease (Borrelia) and other tick-borne infections to humans, dogs and horses. My Lyme disease was misdiagnosed for three years, despite a bulls-eye rash after an insect bite which lasted 14 months. My GP thought you could only get Lyme disease in the USA, so the opportunity for early treatment was missed. I asked to be tested for it but was refused. Although my initial symptoms were vague and the onset gradual, within three years the headaches were so excruciating it was like having a knife embedded in my head and I thought my eye was going to explode. I had a stiff neck, pelvic and rib pain, tremors, and terrible fatigue. I needed help getting out of chairs, I had difficulty rolling over in bed, and I couldn’t stay awake long enough to eat a meal. Finally, I persuaded my GP to refer me to a specialist who diagnosed Lyme disease, despite negative tests. I had a high level of antibodies but they could not identify what they were but was told I was lucky to have had the rash or I would get a misdiagnosis of MS. The characteristic bulls-eye rash is diagnostic for Lyme disease. When such obvious cases are misdiagnosed for so long, how many undiagnosed cases are there? The World Health Organisation says it will become epidemic by 2028. So why is there a lack of information available for the public and GPs? Left with no option but to seek private treatment, I found a doctor who believed that longer and more aggressive treatment was required and I started on three antibiotics. A few months later I began to feel better and was gradually able to get my life back. However, I also have to be careful about nutrition and take supplements to give constant support to my severely weakened immune system and to this day I still need treatment. Without such comprehensive treatment I believe I would have died. Together with Lorraine Murray, another Lyme disease sufferer, I want to make sure that Lyme disease treatment protocols are changed to acknowledge the mounting evidence of its complexity. 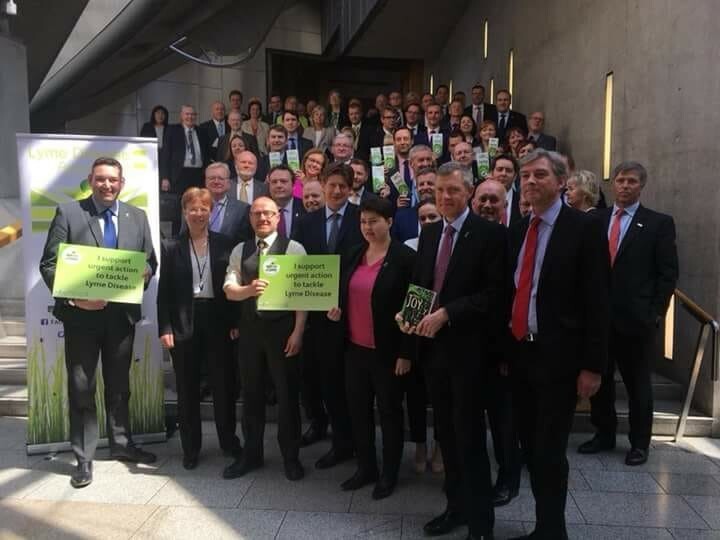 We have set up the ‘Tick-borne Illness Campaign Scotland’ and have submitted a petition to the Scottish parliament for improved treatment for patients with Lyme disease and associated tick-borne diseases. We are very grateful for the open support for our petition from gamekeepers and moorland managers. Lyme disease testing is unreliable and many tick-borne infections are only just being discovered so there are no current tests, and yet the absence of evidence in such cases is being used to refuse treatment. Ticks transmit multiple infections including Lyme disease, and these cause more severe and prolonged illness than with one infection alone. The ability for Lyme bacteria to evade both the immune system and antibiotic treatment has been established by research and acknowledged in a recent report to the US Tick-borne Disease Working Group. It is now time for that to be acknowledged in Scotland and for treatment protocols to be amended to ensure patients get appropriate treatment. Thank you to Lorraine and Janey for setting up Tick borne Illnes Campaign, petioning to Parliament and supporting sufferers throughout Scotland with their Facebook group LymdiseaseAlba. My story is similar to Janey’s, left undiagnosed with no treatment from NHS. I too have private treatment unlike many people who cannot afford treatment and are left to suffer this very painful and debilitating illness. Thank you for helping to highlight this dreadful disease.